CHICAGO -- Erik Spoelstra issued the order to LeBron James during every timeout in the fourth quarter, even if it was truly more of a plea. "We cannot have you fatigued," the Heat coach yelled to James over the ear-rattling din at the United Center. "For us to have a chance to win, you cannot afford to get tired." Dwyane Wade's résumé might still be deeper, but the Miami Heat's playoff run is starting to turn into James' clutch coming-out party. It happened twice in the Heat's takedown of the Boston Celtics in the previous round as James delivered a couple of the most impressive pressure performances of his career. It happened again Wednesday, this time in Game 2 of the Eastern Conference finals in what felt like a must-win game against the Chicago Bulls. James didn't get tired; he got stronger. And now the Heat are headed to Florida with home-court advantage after an 85-75 victory to even the series at 1. "Someone had to do something," James said. "And I knew the ball was going to be in my hands." This was not the case just a few weeks ago. After James went through some midseason trauma with the inability to convert clutch baskets in big games -- he failed twice against the Bulls, as a matter of fact -- the Heat quietly and clearly turned the late-game keys over to the more even-keeled Wade. It worked, too. James accepted his role as the second option, and the Heat became a more poised team in close games. This series is a long way from decided and Wade might be called back to the fore, but right now the pendulum has swung back to James as the Heat's playmaker in the clutch. And despite failures in the past that started to dog his legacy, James is answering the bell. This time it was three stomach-twisting jumpers right into the teeth of the Bulls' famously gritty defense with the game in the balance. Combined with several individual defensive stops that were part of a team-wide clinic, James added another chapter of fourth-quarter dominance to this postseason. He scored nine of his 29 points in the game's final six minutes, turning a bloody stalemate into an unexpected landslide that changed the momentum of the series. "I work on this every day," James said. "It pays off in moments like this." James was referring to his scouting report, which has been the same for years. Back off him and make him shoot, especially under pressure. It humbled him when the Spurs wrote the book during the 2007 Finals, the miserable sweep in which James managed only 32 percent shooting in a barrage of ugly jumpers. He's been battling it ever since. This was the Celtics' plan and now the Bulls', too. He hasn't completely conquered it, but that book is starting to require new entries. James is in the midst of his best season shooting long jumpers, his percentage climbing from 37 percent in 2007 to 40 percent last season to 45 percent this season. Now, it's starting to show when it matters the most. Against the Celtics, it was a series of 3-pointers under duress that swung two games and crushed the opposition's will. He did it again in Game 2, starting with another confident 3-pointer that altered the game's course. This one happened right after a pivotal timeout midway through the fourth quarter. In a tie game, the Heat converted one basket in nearly seven minutes. The crowd sensed the Bulls were about to break through, and perhaps the Bulls did, too. The Heat had been getting by with miniature miracles all night. Spoelstra's game plan was in tatters. He played 11 guys in the first quarter alone, using lineups he hadn't used in months or even ever. The Bulls' rebounding and foul trouble for his big men had Spoelstra stalking up and down the bench, seemingly choosing players at random, hoping for a spark. Most failed, but he hit on something with Mike Miller and Udonis Haslem, the bench's two most maligned players after a season full of injuries. Their unexpected production -- Haslem had 13 points and five rebounds, and Miller came up with seven crucial boards -- maintained the Heat's hopes. But now it still seemed like it was slipping away, the Bulls tightening their grip with their constricting defense while Derrick Rose and friends did just enough at the offensive end to win. The play was a 1-3 pick-and-roll, Mike Bibby and James. A standard set. Bibby did his job, setting the screen on James' man, Luol Deng. According to the plan, Deng dropped away from James to protect against the drive. Let him have the jumper. James stopped, squared and drilled the 3-pointer as if he were Ray Allen. Then he did it again. And again, the last one a 20-footer on a step-back move that sent the fans to the exits. Three times in just more than a week, James had ended playoff games with this sort of heartless execution on what is supposed to be his weakest shot under circumstances he hasn't always handled like a two-time MVP. "At that time in a game like that, you have to take the best shot," James said. "I've made plenty of those." In practice, yes. In midseason games, yes. In defining playoff games? Well, that list is starting to grow. "Everyone backs off me and dares me to take jumpers," James said. "I've got to be confident about it." CHICAGO -- The Chicago Bulls can get away with shooting 34 percent, as they did in Game 2 against the Miami Heat on Wednesday night. They can get away with Derrick Rose and Luol Deng throwing up one brick after another. The Bulls can even steal a victory against an elite opponent when they miss free throws and misfire on one 3-point attempt after another. But what the Bulls cannot do and expect to win against a team as good as Miami is play poorly on defense and get beat on the boards. That, for these Bulls, is a killer. It's a one-two punch that spells doom. This, boys and girls, is the rhythm of an NBA playoff series between worthy opponents. One team wields a bludgeon in Game 1; the other comes back swinging from the heels in Game 2. The Bulls sat around for three days hearing how great they were after going Sandy Koufax perfect in Game 1; the Heat sat around their hotel rooms for three days stewing in the talk around town of how they stunk up the joint and looked to be a bunch of overrated bums. But as Dwyane Wade said afterward about a trip north to Chicago that ended better than it started, "We had plenty of time to hear about it, then plenty of time to do something about it." And as a result of getting beat at the things that earned them 62 wins, a No. 1 seed in the playoffs and series victories over the Pacers and Hawks, the Bulls now have plenty of time to reflect on what they'll consider an inadequate effort. You could see it at the start. Chris Bosh got loose for an uncontested dunk to begin the game. Miami's second basket was a layup from LeBron James, who cut to the basket hard and took a nice pass from Wade. Bosh made a pair of foul shots, and then Wade scored on a layup. Miami's fourth basket? A Jamaal Magloire dunk. After that, LeBron hung in the lane for an easy one, then Wade soared for a dunk. Never mind that the score was even in a back-and-forth game; Miami went hard to the basket on virtually every possession early with precious little resistance. The Bulls' defense didn't come close to resembling what we've seen all season, not with Miami living at the lip of the rim. Zach Harper, TrueHoop Network bloggers and fans gave their in-game opinions on all topics throughout Wednesday's slate of NBA playoff talk in Daily Dime Live. LeBron James, Heat: Clutch night for LBJ with 29 points, 10 boards and strong defense in a Game 2 slugfest. James scored nine points over the final 4:27, starting with a 3-pointer that put Miami ahead for good 76-73. Next stop: Miami. Bulls' shooting: Shooting 34.1 percent from the floor will generally not get it done, especially if you're not dominating the boards like you did in Game 1. Credit the Heat's defense, but Derrick Rose's 7-for-23 line was not MVP-worthy. "I talked to him two days ago, and there was a look in his eye. I've been through a lot of battles with that warrior, and I knew it was time to put him in." CHICAGO -- It was obvious from the end of the national anthem. At that moment in the United Center before the Miami Heat and the Chicago Bulls met for Game 2 of the Eastern Conference finals, it was easy to see that there would be something different, something special, about Udonis Haslem's night. Haslem was still standing at his pregame spot near the free-throw line, with his head bowed and eyes closed, long after players from both teams had retreated back to their respective benches following the conclusion of the anthem. More than 23,000 people had crammed into the building. But in that instance, Haslem was all alone. "That was a moment for my mother," Haslem would reveal hours later about his late mother, Debra Haslem, who died last summer after a lengthy battle with cancer. "If she could be here, she wouldn't miss this for the world. So I was just talking to her. I always do it before games, but this one was definitely a little more emotional for me. I was thinking about my mother. I was just praying." Eventually, Haslem would jog back to his team's huddle -- one that was already in progress with coach Erik Spoelstra offering his final instructions before what turned out to be the Heat's 85-75 victory over the Bulls to even the series at 1-1. 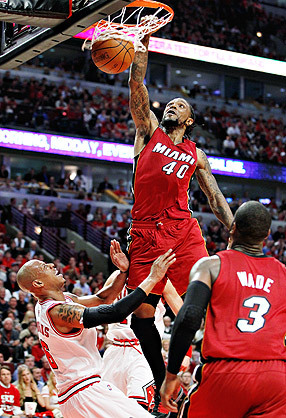 Heat reserve Udonis Haslem had a big dunk here on Keith Bogans. The 6-foot-8 forward sat out the last 69 games of the regular season and the first eight of the playoffs. In Game 2, Haslem played 23 minutes, netting 13 points and five boards. 8. Why No Double For Dirk? DALLAS -- Six different Oklahoma City defenders drew the assignment of trying to stop Dirk Nowitzki during Game 1. All six failed miserably as Dirk dropped 48 points on the Thunder in historically efficient fashion. Well, how about committing a couple of defenders to Dirk every time he touches the ball? The Thunder hardly doubled the Mavs' MVP at all in the series opener. Of course, it's not as if Oklahoma City coach Scott Brooks didn't consider that option. He had good reason for opting against doubling Dirk. "You double and you give up a lot of 3s," Brooks said. "They made 12 or 13 3s a game against the Lakers, and that's what they do. They're a good team and they put you in positions [where] you have to make decisions. We made the decision to really stay at home against their shooters and it didn't work." The Bulls and Heat combined for 24 points in the fourth quarter of Game 2. That matches the third-fewest fourth-quarter points for two teams combined in an NBA playoff game in the shot clock era. Cleveland and New Jersey combined for 19 points in the final stanza in Game 5 in 2007, Atlanta and Miami (21) in Game 1 in 2009, Utah and Portland (24) in Game 1 in 1999.